Tony Hu knows that some might find the supersize image of the smiling, waving Mao Tse-tung that looms over the bright yellow dining room at Lao Hunan disquieting. It does have an inescapable resonance, particularly together with the famous paraphrased slogan "serving people" emblazoned across the wall—and that's not just because an early printing of the menu included a dish called "Human Pork Liver." That typo has since been corrected, and if you ask Hu, the de facto Mayor of Chinatown, he'll explain that Maostalgia is currently very "hip" in the PRC, most Chinese viewing the Chairman not as the ruthless dictator who starved millions of his own people, but the national hero largely responsible for the country's current ascendance. His policies (including the Great Leap Forward, Tibet, and the Cultural Revolution) are justified mathematically: 70 percent right, 30 percent wrong, the saying goes. Or, as Hu puts it, "Everybody makes mistakes." If you doubt such a forgiving perspective will sell here, you might ask the grinning middle-aged gent I spotted on one recent visit, who rose from his loaded table clad in a tight black Mao T-shirt and posed for a photograph with one of the servers, whom Hu has outfitted in olive green Red Army uniforms. I've seen them saluting customers in greeting and farewell. Hu, as you might know, is the chef-entrepreneur behind Lao Sze Chuan, Lao Beijing, and Lao Shanghai, and the city's most prolific and passionate proponent of Chinese regional cuisine. His recent projects, if you take the trippy Lao You Ju as evidence, seem to be increasing in theatricality. If his gamble on this particular historical production rubs you the wrong way, I'm here to at least advocate for his successful exploitation of Mao's lifelong devotion to the simple peasant food of his southern home province. 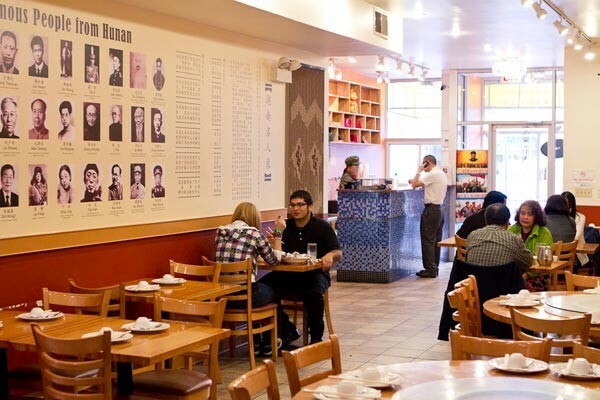 Hunan is a name frequently and meaninglessly attached to generic takeout joints across the country, and also ironically happens to be the home of General Tso Tsung-tang, for which the most Americanized of Chinese dishes is named. But that sort of bastardized food bears no resemblance to what's going on here. It has its own name—mao jia cai, "Mao's home-style cooking"—and is characterized by a liberal use of pickled vegetables, salty smoked meats, and lots of garlic, shallots, and chiles. Mao, in fact, is supposed to have said that one can't be a revolutionary without eating chiles. 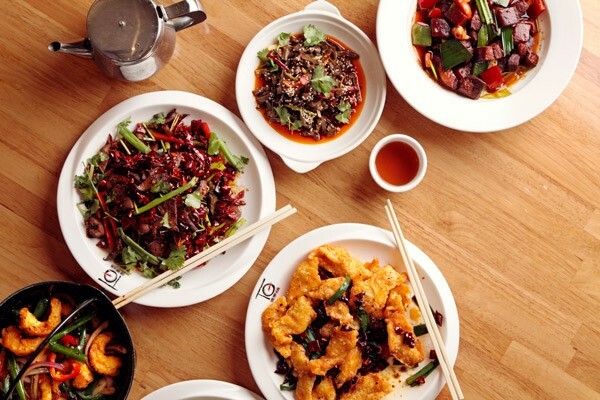 Hunanese cuisine differs from the equally spicy food of Hu's own home province, Sichuan, in that it is a "dry" style of heat, less sweet, and largely absent the numbing ma la effects of the Sichuan peppercorn. It's no less narcotic. To pull it off, he's recruited chef Jin Chang from New York City, a veteran of Hunanese hotel kitchens. The menu, while not yet as encyclopedic as those at the other Laos, is filled with powerfully seasoned dishes you won't find anywhere else in town, beginning with a small selection of cold appetizers: dense slivers of tofu bathing in a subtly infused orange chile oil, or a mound of bracing, mouth-puckering tai gan-pickled green vegetables sprinkled with sesame seeds. Many of these dishes are loaded with a gradually ascending heat that may bring you to the edge of agony, but never so much that it imbalances the other flavors. The shining example of this is Famous Hunan Chile in Black Bean Sauce, a deceptively simple plate of two imported green chile varieties—one long, one short—whose mounting intensity never obliterates the earthiness of the fermented beans. It's one of the most irresistible things I've eaten all year. But there are other contenders, such as ground pork with pickled vegetables, a mince of tangy greens, red peppers, and meat; it's a kind of Chinese giardiniera that should be applied straight to your rice. Or take the hard-fried nuggets of tilapia, a typically insipid fish redeemed by the peppery oil, blazing chiles, and chopped green onions. Sour, vinegary flavors or warm spices such as star anise and cinnamon play off the heat; the last two particularly evident in a set of mini hot pots filled with a minimal amount of liquid from which to pluck seasoned morsels of house-cured bacon; sweet, crunchy prawns; or bony bits of frog with wood-ear mushrooms. You can also sense this in the red-braised pork belly, said to be Mao's favorite dish, chunks of melting meat, slow cooked in cinnamon, ginger, and star anise. Sustained heat requires some foiling, and there are milder dishes available for relief—meaty black thousand-year eggs with stewed bok choy, mild soups with taro and vegetable or clam and squash—which are unaggressively seasoned. It's OK for revolutionaries to ease off now and then. Dubious political kitsch aside, what excites me most about this new restaurant—one of my favorites of the year—is that Hu isn't finished with it. He's scheduled another research trip to Hunan in November and is planning to double the menu on his return. Incidentally, he's also making a stop in Taiwan along the way to research dishes for his next regional restaurant, which at least for balance ought to feature a mural of Mao's Nationalist nemesis, Chiang Kai Shek. The city’s singular expression of food from China’s southern province reigns in Greektown. A few shots of some tasty dishes from Tony Hu's new Lao Hunan in Chinatown.